This box features the languid hand gesture of Tara, known as the bodhisattva of compassion or the Swift One because of her immediate response to those requesting her aid. She is also called the Liberator and goddess who grants all wishes. Tara is said to have been born from a lotus blossom that sprang from a tear shed by Avalokitesvara, god of compassion. She holds the stem of a lotus, symbol of divine purity. The attractive gift box is made with sustainably harvested Himalayan lokta paper on top of a recycled paper board. Inside the 3.5'' square box you''ll find a cushion, striker and 3'' dia. 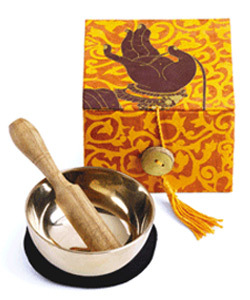 bowl along with instruction for care and how to use the bowl for a simple meditation. 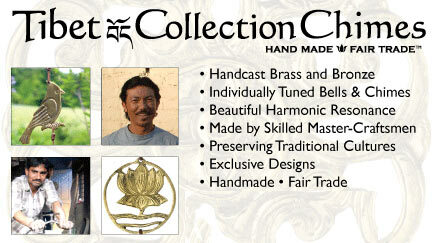 Handmade in Nepal by skilled artisans using traditional crafting methods.